I note that some people want to have their own skin with a spider body. 1: the spider queen and the player does not have the same upper body, while it looks similar, it has different dimensions, and putting a normal player skin over this will most likely cause the skin to be cut, warped, or have some parts not covered. This could look really weird. 2: Most skins don't really look good with a spiderqueen body. It would look awkward at best and down right wrong at worst. If it is not implemented or planned on implementation yet, you guys should definitely put in a block that replaces the necessity for white whool. As I saw in a rather interesting idea suggestion reply way back in the old 1.2.5 Spider Queen Mod post for Minecraft, you should have a third block stage of webbing. Dense webbing that basically acts like a solid block so as to have neatly hung web houses from the ceiling. 3 web-fling = regular minecraft cobwebs. 5 web-fling = dense web block. Behaves like wool, looks more spidery and can be crafted with string or simply woven in with your natural webbing. Great Idea! Added just now! Hey guys, mario here, its wonderful to see great progress made on the mod! why aren't you contactacting me on skype? I can't wait to see this mod completely finished. I loved the idea of this mod. um lemonszz can we get a percentage of how much is done??? These are the things I want implemented before a beta release of the mod. This is something that is really important for the mod, there is one feature that I would like to add to this before a beta release. Web throwing is done, you can throw webs at floors, walls and mobs. Shooting a web at a surface will create the climbable web, a few times more a full spider web and another few, a soild web block. Web climbing is done! You can climb webs - by holding your sneak key or just walk through them. This was one of the most important features of the mod. A few features left to do with these and a few more mob types to add. You can eat them to gain hunger and gain some webs. These are some of the most complex parts of the mod, I'm working hard on these. These are going to in in eventually, I want to overhaul these from the original mod. This will come sometime later. Most other things I didn't mention. if you start a new world with the mod, will golems be friendly to you and monsters hostile to you like normal, or will golems be hostile to you and monsters friendly, or will both monsters and golems be neutral to you? And by player model, do you mean that when we play as spider queen, we'll need a entrance to be at least 2x2 to go through, or do you mean just looks? Monsters will be hostile towards you, you are feared by all! For now the player hitbox would be the same, for simplicitys sake, although it may change in the future.Also, I forgot to post this the other day! For now the player hitbox would be the same, for simplicitys sake, although it may change in the future. Also, I forgot to post this the other day! When the player hitbox is fitted to the spider queen body, maybe you can add special doors and trapdoors, that they can fit through. I understand this footage is of unfinished beta content, but I felt like throwing in a quip anyway. You DID say you were 60% done with cocooning, but I still wanted to say I don't think it should cost only 1 weball to cocoon any type of mob. Assuming this will stay (which I doubt) I propose an interesting cocooning mechanic that was not in the original mod and would make hunting for mobs much more active, instead of a chore like it sometimes used to feel. When trying to ensconce a mob in your web, the mob should have slightly reduced speed and be partially covered in webbing. The web coating and speed reduction increase with each successful weball hit. Since it was completely random how many it took per mob in the 1.2.5 version, I often got frustrated if I was just missing multiple times, if it was just a randomly tough mob to web, or both. This will let the player know if they actually hit the mob, as many players might choose to capture from a distance for obvious reasons. It supplies an ACTIVE visual satisfaction of your mid-battle efforts, which is a huge plus from how it used to be with weballs sometime seven bouncing off the target for no reason. Depending on the type of mob, the target can slowly break out of their webbing if you do not keep the barrage up on said target. Neutral mobs merely flee for their lives upon the first successful weball hit. Depending on the size of the mob, the webbing can degrade and the mobs speed returned based on how long they are left 'struggling' in the webbing. Hostile mobs obviously target you immediately, but can break out of webbing significantly faster. Cow: Requires 7 weballs to fully cocoon. Can break down a single layer of webbing in 1.2 seconds. Reacts to a web layer with fleeing. Zombie: Requires 15 weballs to fully cocoon. Can break down a single layer of webbing in 0.6 seconds. Reacts to a web layer with aggrevation towards player. Adding another layer of webbing with a another successful weball hit to the mob will reset the mobs layerbreak timer. This would mean if you never missed, you can have a 100% successful capture of a zombie and only use the minimum requirement of weballs to secure your meal. In the zombies case, 15 until full cocooning. This idea of slowly decreasing your targets mobility as you weball them makes it feel much more satisfying and 'real', instead of something like fishing on land and severely lacking, as it used to in 1.2.5. Once the mechanic is in place, it can be vastly expanded upon for different outcomes with future mobs. Perhaps wither skeletons react in a violent way to being webbed, and actually increase in speed for the first few stages of webbing, making it actually easier to kill wither skeletons with a sword instead of with webbing to capture them alive entirely. 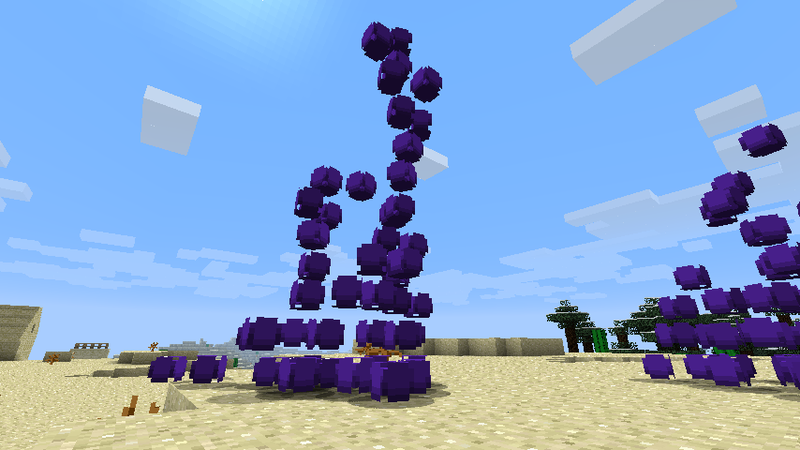 Or Endermen can break off all existing layers of web with a single teleport, making the player have to act fast to capture the Enderman before it teleports again and resets your weball count for its capture. Or a mob with armor such as a rare zombie or the to-be-implemented humans are much tougher to incapacitate. Each armor piece increases the amount of needed weballs by +50%, thus resulting in a full set of armor making a mob require three times as many (+200%) weballs to capture. This mechanic I think could REALLY go places and make it just as much of a challenge and gamble for which enemies you choose to attack just as in vanilla Minecraft. You have to take your sword power, armor, current potions, and even escape routes in mind depending on the brutality your target is capable of. The fun and self-caution that this brings the player in vanilla Minecraft should be equally as enjoyable if not more so for The Spider Queen Redux as you are introducing an entirely new way to deal with mobs. I always felt that the cocooning mechanic seemed hollow and too easy. It essentially removed the threat that almost ANY mob had to you as long as you had weballs to spam. Even skeletons, as your web-fling distance was superior to their bow distance. In technical terms, I am unsure as to how you would achieve this. You could make pre-made exterior-skins for all cocoonable mobs, and merely slow the speed and set a certain skin that appears slightly webbed. Or you could perhaps make actual 2d webbing that is a seperate entity which attaches to look as though it hangs from particular body parts of the partially cocooned mob. But regardless, the general combat of The Spider Queen is either with a sword (which is unchanged to vanilla Minecraft) or non-existent if the player has webbing to burn, as cocooning is a better option for handling mobs and even gives more benefit than merely killing them anyway. First off, thanks for the awesome, well thought out reply! I love the idea of that sort of system, it really sounds like it would work well and fit in. Probably the only thing holding it back would be technical limitations, but if I were to do it I'm sure I could think of a way to sort of do it. I think I may look into adding something similar after beta is over to spice things up a bit.